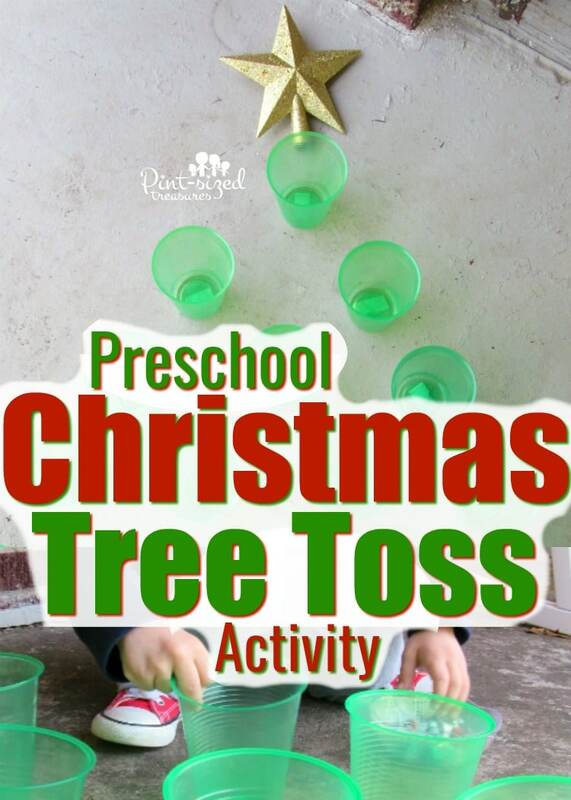 Home › Creative Creations › Crafts › Preschool Christmas Tree Toss Activity That’s FUN! Preschool Christmas Tree Toss Activity That’s FUN! Preschool Christmas Tree Toss Activity is super simple and fun! We love to keep all crafts and activities simple — just like our simple, DIY Christmas tree garland! preschoolers can make! And before you start this activity, make sure you have Christmas music blasting to dd to the fun! 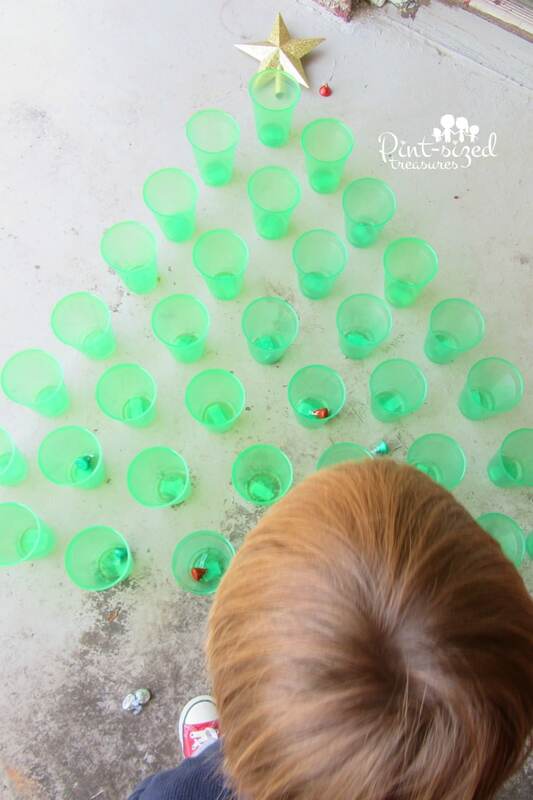 I love throwing simple games together — games that require few materials and have such easy instructions that every one can’t wait to take their turn! Only have one preschooler on your hands? This is a perfect learning game for even one preschooler to enjoy. From one child to an entire class, this Christmas tree toss activity will be sure to bring out the smile and giggles — especially since chocolate is involved! And I love adding the Christmas star to the top of the tree in this game — makes me get all warm and fuzzy inside! 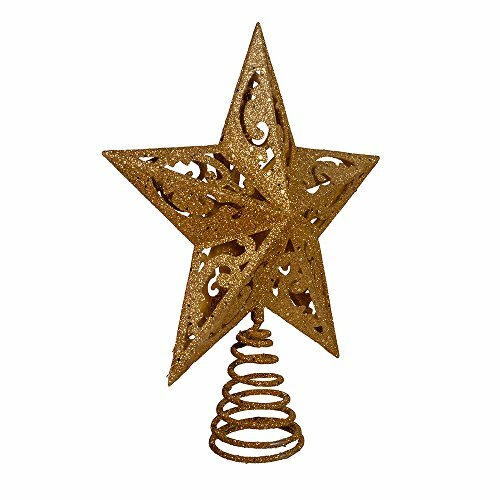 There’s something special about a Christmas tree topper, isn’t there? And this game is completely flexible. You can switch out the cups and even the objects to toss. We want you to be able to have some holiday fun without stressing about the exact materials for the game! 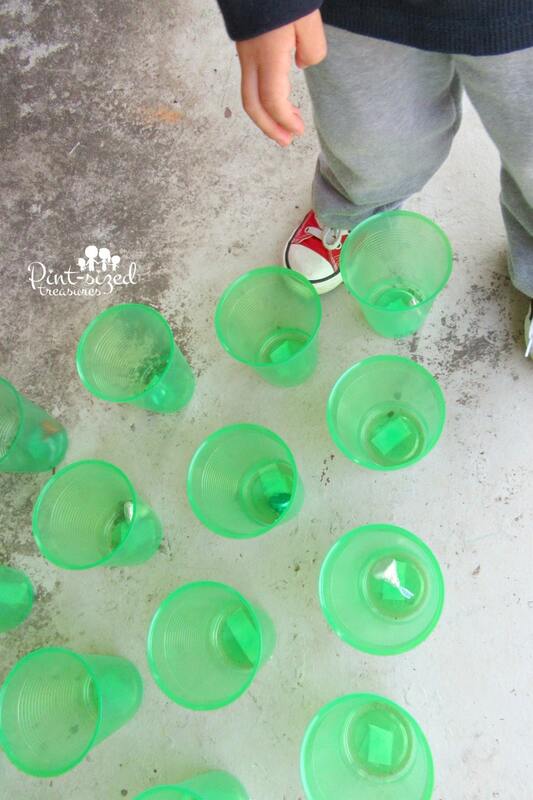 But, it is cutest if you use green disposable cups for this activity — don’t ya think? Here’s another Christmas tree activity that kids will love — it’s even 3D! 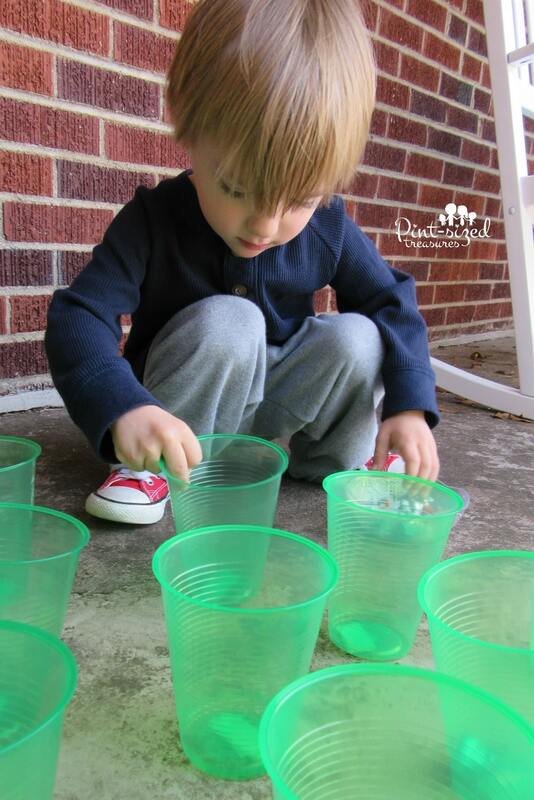 Games are the absolutely perfect way to teach your preschooler some fun and simple concepts! This simple activity can be used to teach colors, counting and sequence. 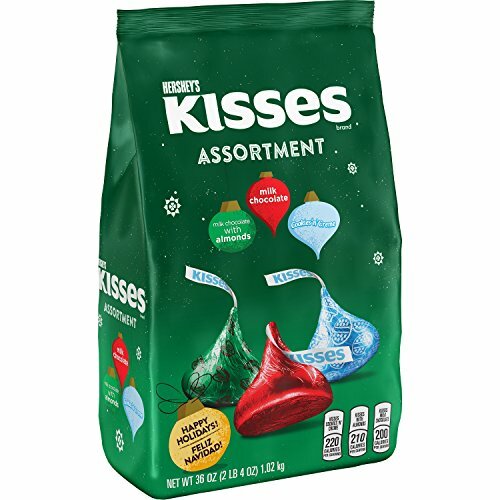 Have you preschooler count the kisses as he tosses them into the cups. Have him count the ones he got into the cup and the ones that landed outside of the cup. Tell your preschooler to toss the green ones first, the red ones second and the gold kisses last. Theses are simple learning add-ons but a powerful way for your child to learn any of the basic concepts a preschooler may struggle with. This colorful handprint twister is a great way to teach colors too! Ready for the full instructions and supply list? Snag it below! 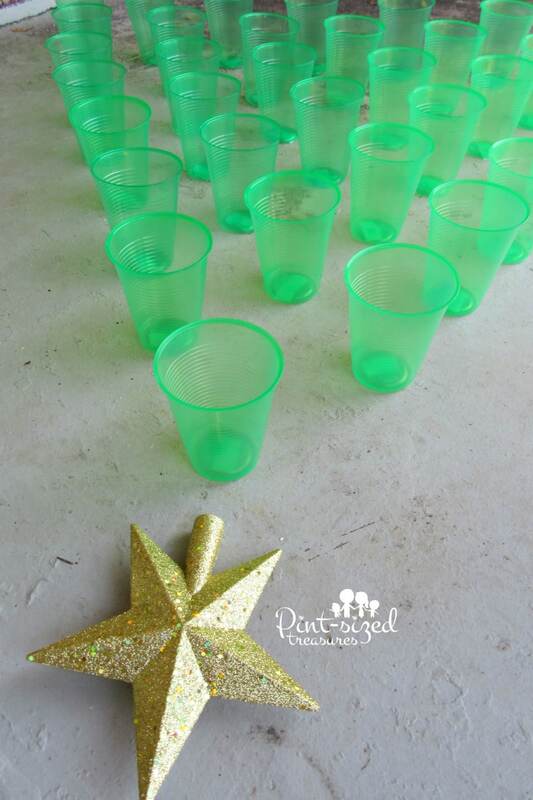 Form a Christmas tree shape with the cups and tape cups to the ground or floor to secure. Place the star at the top. 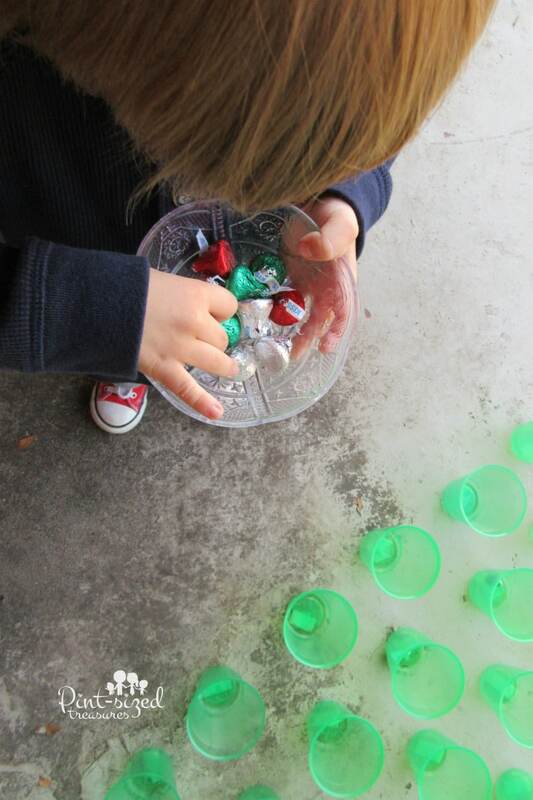 Let your child toss the kisses into the cups. For each kiss that lands in the cup, he receives one point. First child to get 10 points, WINS! *Optional twist: Stack cups on a table in the shape of a Christmas tree. Everyone gets one kiss. The first child to knock down the stack of cups WINS!